Depending upon the fan sizes and speeds users will achieve various air flow, air pressure, and noise level values. You can find out the specifics of each model by clicking the links above. However, to give you an idea of the key noise levels emitted from these 'silent' fans; the 120-millimeter variant produces a sound level of 16.4 decibels, while the 140 mm model produces only 15.5 decibels. 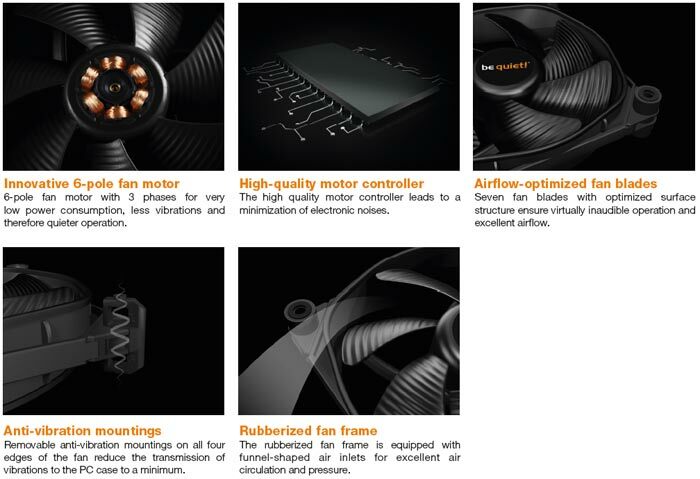 Key technology implemented in the Silent Wings 3 fans series includes the latest version of the fan blade design. There are seven blades per fan, optimised for airflow. The fan units use a funnel-shaped design in a rubberized frame for increased throughput. 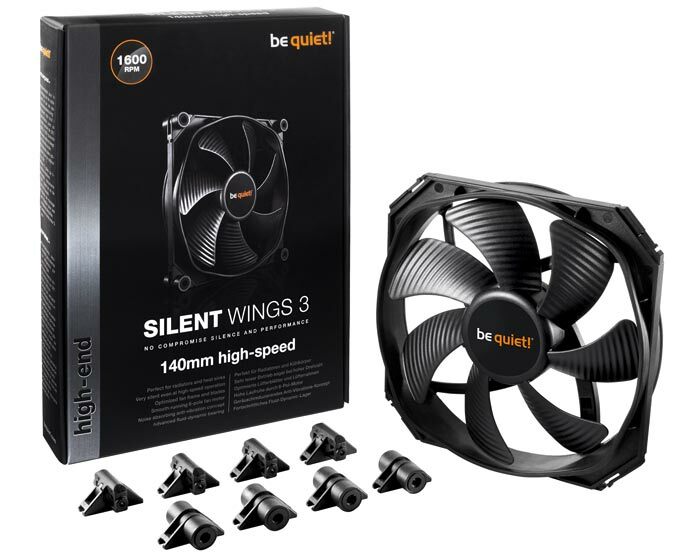 The new design and powerful air moving capabilities mean that Silent Wings 3 fans are ideal for radiators, heatsinks, and computer cases. Aiding in the smooth, quiet running and lifespan of the new fans, be quiet! 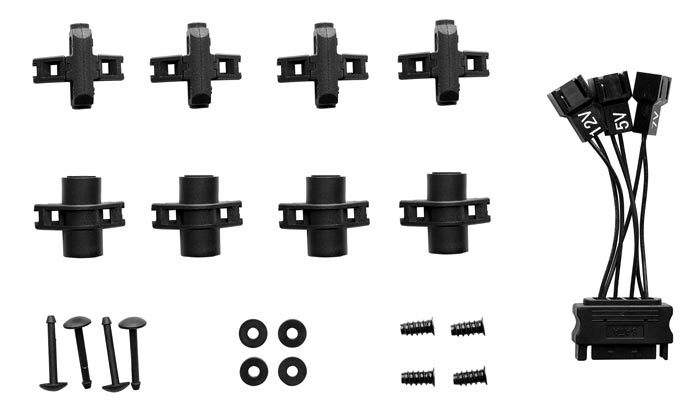 uses an anti-vibration mounting system with modular corners, and an advanced fluid-dynamic bearing with a brass core. Whichever of the new fans you choose you should get a product with a lifespan of approx 300,000 hours. According to the press release the be quiet! SilentWings 3 fans are available immediately. The 120mm variant is priced at $21.90 / £18.99 / €22.50 while the 140mm variant will cost $22.90 / £19.99 / €23.50. One thing I could never figure out about the Silent Wings 2 series, why would a fan rated by the manufacturer at up to 300,000 hours only have a 3 year warranty? 300,000 hours equates to 34 years. I presume the “rating” is to do with the expected life of the motor component, however the warrenty covers the device and accessories as a whole. Exactly! The only component anyone would take seriously in a fan (as far as warranty is concerned) is the motor itself, while the miscellaneous petroleum-based bits are essentially irrelevant unless they are damaged during production. The only way a fan blade is going to break is if I do it myself, and for that you can't (or at least shouldn't) claim any warranty status, as that would be silly. Thus, you're left with a three-year warranty on a (supposed) 34-year motor. Once upon a time in America there was a company called Craftsman Tools who offered lifetime guarantees on their manual tools (wrenches, screwdrivers, shovels, etc) - since 1927, if these broke for any reason during the lifetime of the tool, they were replaced on the spot just by walking into the shop without a receipt. Naturally, as the years went by, the corporate-types decided this was a silly idea and so since 2012 have reduced it “officially” to 25 years with receipt, which still sounds generous, but any time you start limiting your previously unlimited things, you've already lost the plot. In other words, it's reasonable to expect the plasticy bits of the fan to last a quarter of a million years, but if I left a fan running for decades, I'd expect the motor to be the first thing to cause trouble. All that being said, the Tuniq Tower Cooler I bought 10 years ago (all the rage when C2Q's came out) had a fan that ran 24/7 for all those 10 years and was still spinning quietly when I retired it a few months ago. As far as I could tell from Tuniq they only ever made claims about the db-level of the fan at speed (assuming they even produced it), not its lifetime. I'm just saying that the Germans seem to have an odd conception of warranties and mechanics, is all. This site http://www.silentpcreview.com/article1346-page6.html has best fan comparison I've managed to find. Interesting that they say airflow is not a major factor so it simplifies to which fan has the lowest temperature rise vs noise. 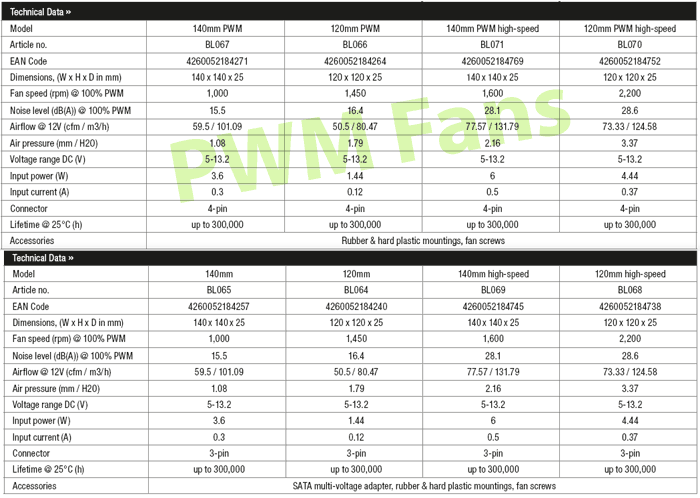 To me it looks like most fans in the list are very close in performance and there is only a small rise of a few degrees by running the fans much slower and quieter.